Red40 appears in a number of cough rememdies when the manufacturer uses a cherry, strawberry or "berry" flavoring to cover up the horrid taste of the active ingredient. If it tastes like cherry, then it has to look like cherry too... 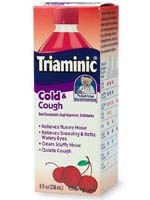 Sometimes, if the cough syrup is grape flavored, they'll use both Red #40 and Blue #1.